To provide information on the history of the various patterns of collectible glass and pottery; exchange knowledge of glass; standardize nomenclature and methods for identification and aid in the preservation of glassware. The Houston Glass Club was established in January 1974 and today has ~50 members who come together monthly to share information, identify new found treasures, and have ongoing education about the numerous glass patterns available for collecting. 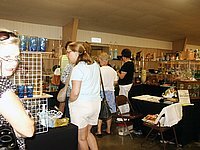 Members are from all walks of life and diverse interest; from professional dealers to the avid collector to those just interested in learning more about “Grandma's old glass”. Whether your interest is in depression, milk glass, china kitchenware, or finding more about your collection, you will find someone with a similar interest. Bring a friend or make some new ones. Everyone is welcome at the Houston Glass Club! The club meets the second Tuesday of every month in the Education Wing of Gethsemane United Methodist Church, 6856 Bellaire Blvd., Houston, TX, from 7:00 to 9:00 PM. Meetings consist of a short business meeting, followed by an informative presentation on a specific American made antique or collectible glass, pottery or dinnerware pattern or maker. Refreshments are served and door prizes are drawn. 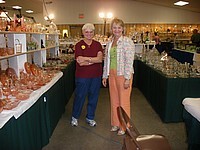 Members and guests often bring glass for “Show and Tell” to have a piece identified or just to show a special find. The Houston Glass Club maintains a library for members’ use. The library contains approximately 400 books on American glass, china, pottery and other related collectibles. Members may check books out on a monthly basis to learn more about there favorite patterns. New, updated glass books are added to the library on a regular basis. The club also purchases and donates books on glassware to the Houston and surrounding libraries for the education and pleasure of the public. 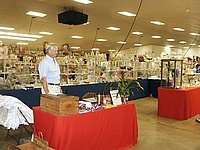 The club's annual fundraiser is it's nationally recognized glass and antique show & sale held every year in August at the Fort Bend County Fair Grounds. 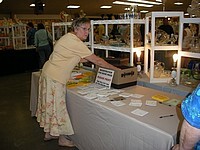 The club will have sponsored the show for four decades, which has a reputation of having high quality and hard-to-find glassware. Rumor has it that if you haven't been able to find that special piece or pattern, you will at this show! 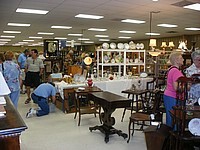 The show dates are always the third weekend in August at the Fort Bend County Fairgrounds. If you are a lover of glassware, interested in American history through glass, a dealer, or a collector, The Houston Glass Club is just the organization for you. Visit us and see for yourself! Guests are always welcome!